The Congressional Budget Office (CBO) just released some interesting graphics, showing spending projections for means-tested programs and tax credits, i.e. those programs and tax credits that are only available to low income households. Medicaid is the largest such program, at $251 billion in 2012, followed by Supplemental Nutrition Assistance Program (SNAP) at $80 billion. The refundable portion of the earned income tax credit (EITC) is next largest, at $54 billion, while the refundable child credit costs $28 billion. The refundable portion of tax credits are scored as spending, since they exceed any tax liability. The growth of these programs and tax credits over the last two decades mainly reflects increasing participation, as more and more people were made eligible through such legislative expansions as the 2009 American Recovery and Reinvestment Act. Participation for the EITC grew from 9 million in 1991 to 25 million in 2011, while participation for the child credit grew from zero to 21 million over the same period. The recent fiscal cliff deal extended these expansions to the EITC and child credit for another 5 years. These programs and tax credits form a large and growing share of so-called mandatory spending, which also includes Social Security and Medicare. As the chart below shows, mandatory spending represents the majority of the federal budget, and the part that has grown most dramatically in recent years. 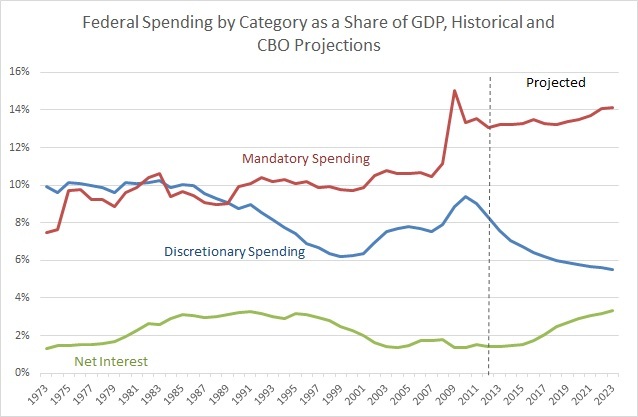 Mandatory spending was about 10 percent of GDP for most of the 30 years prior to 2008. It leapt to 15 percent of GDP in 2009 and now remains at 13.1 percent. It is projected to increase to 14.1 percent of GDP by 2023. Meanwhile, discretionary spending, on programs like defense, roads, and other infrastructure, is on a steady decline. Discretionary spending is now 8.3 percent of GDP and set to go to a 50 year low of 5.5 percent of GDP by 2023.